Walking in a lively way can encourage physical and mental habits that help you look and feel younger, healthier, and happier. 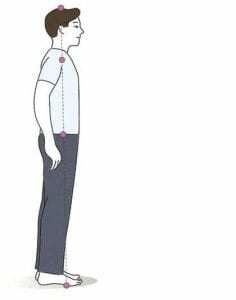 Energy walking involves walking with your body in a certain alignment while maintaining focus on your yong chun acupressure points just below the balls of your feet. These points mark the beginning of the kidney meridian, which is important for vitality and courage, or according to Asian translation “youthful longevity”. Vitality is especially affected by our posture. Many people have poor posture that only gets reinforced through sitting and walking habits. Energy walking corrects posture so that bones and muscles are optimally aligned and balanced. With repetition, legs and postural muscles become stronger and are able to hold you upright so you can avoid the stooping or leaning back that often develops unnoticeably as we age. Of course, the best way to understand energy walking is to try it for yourself. As with all holistic exercise, mindfulness is key; walking is something we do all the time, but how your brain treats it makes all the difference. Breathe with your lower abdomen. Let your heel tap the ground gently as you step forward. Feel your weight transfer fully to the balls (yong-chun) and toes of your foot. Keep your feet parallel, walking on either side of an imaginary line. Let your knees brush lightly against each other. Angle your upper body 5 degree’s forward. Relax your shoulders, swing your arms freely. Remember to push down on your yong chun and lean slightly forward with your back straight and your shoulders relaxed. For an added boost you can pick up your pace (into a march), bend your arms and pump your elbows. Thinking in terms of cross-country skiing may help – except with Energy Walking you are lifting your knees. You can learn more about your “yong-chun” and other important energy centers through my article "How To Activate Your Energy Body For High Performance". Mindful energy walking can optimize the energy circulation through your body. By generating heat in your belly and cooling your head, you can effectively reduce stress, improve digestion, and promote clearer thinking and emotional balance. For another opportunity to create healthy habits join me for my 4-part masterclass. It's complimentary, I'm inviting you as my guest. It's a unique workshop where I will guide you through practices and principles step by step to develop your own success habits. Thank you! Love this information and reminder to get out and get moving with intention and mindfulness.